People downloading to podcasts are still in a minority, despite the hype surrounding them, research suggests. 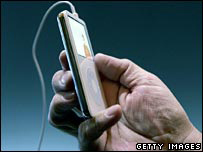 The number of US households listening to podcasts will increase to just 12 million by 2010, a Forrester Research report has found. Tech savvy, young males are most likely to listen to take away audio it said. But a survey by research firm BMRB found that nearly eight million Britons will go in search of a podcast in the next six months. The different numbers could suggest that UK consumers are a bunch of technophiles, much happier to dip their toe into the water than their US counterparts, or that coming up with these numbers is an imprecise science. Charlene Li, one of the authors of the Forrester report admitted on her blog that "measurement is still really hard to do". In particular she said that "counting podcast downloads is a dubious way to measure usage." Podcasts seem to have had a meteoric rise, moving from the preserve of a few interested techies to the technology of choice for any company trying to appeal to the digital generation. It is like a radio broadcast, but one that you can download from the internet to any MP3 player, not just an iPod as the name suggests. You can use pieces of software to automatically gather the podcasts and pop them straight on to your player, meaning that you always have the latest programme in your pocket. The technology has got traditional broadcasters excited and worried at the same time. The technology gives them a new opportunity to distribute their programmes and potentially a whole new audience. But podcasting is cheap. All you need is a laptop, a microphone and a bit of a flair for technology and you can create your own programmes. As a result broadcasters are worried that their market share will be washed away over night by a torrent of amateur broadcasters and companies that look on podcasts as a useful way to get their message out. Hence, broadcasters, advertising companies and financial institutions are all clamouring to work out who is online, where they're downloading and what they're listening to. 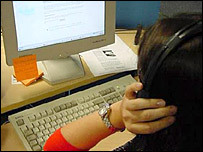 The survey of 5,000 US consumers by Forrester found that 3% had tried listening to a podcast. Of them, 2% had experimented with audio downloads but did not listen on a regular basis. There will be just 700,000 diehard downloaders in the US this year; a tiny audience compared to the 25 million people who tune into stations run by traditional broadcaster National Public Radio (NPR) every week. The report says that it will take a long time for people to ditch their transistors and join this small group of breakaways because downloading programmes is complicated and content is sparse. However, the good news for broadcasters is that the people who persevere gravitate towards audio from established radio stations rather than relative newbies. The Forrester survey backs up some of the findings in a report from another research firm, BMRB. Its survey looked at digital consumption in the UK. It also found that podcasts are the preserve of young males. But it predicts a much quicker uptake of podcasts in UK households, with around eight million adults logging on and walking away with their favourite radio programmes in their pocket by September this year. The huge discrepancy between the figures for the US and the UK could point to relative differences in listening habits, online dexterity or even national character. It could also reflect just how difficult it is to make these predictions. Even broadcasters can only take a rough guess at many people are actually listening to their podcasts. "One of challenges with podcasting is that there are no audited or reliable reporting mechanisms," said Sarah Prag, a senior project manager responsible for the BBC podcast trial. From next week, the BBC will offer 50 different podcasts. 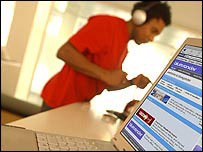 In February, the latest month for which statistics are available, 1.7 million people downloaded BBC content. 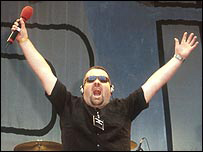 The Chris Moyles show on BBC Radio 1 is the most popular. But according to Ms Prag that only tells the BBC how many files are downloaded. It does not say anything about the number of individuals or whether people are even listening to the files. However the kinds of programmes people are listening to does give a hint about digital demographics. Programmes like In Our Time and From Our Own Correspondent on BBC Radio 4 are not the kinds of programmes people normally associated with the MP3 generation, said Ms Prag. "You would expect Chris Moyles to do well but what this tells us is that Radio 4 is doing extraordinarily well," she told the BBC News website. "It's knocked some of our assumptions on the head."